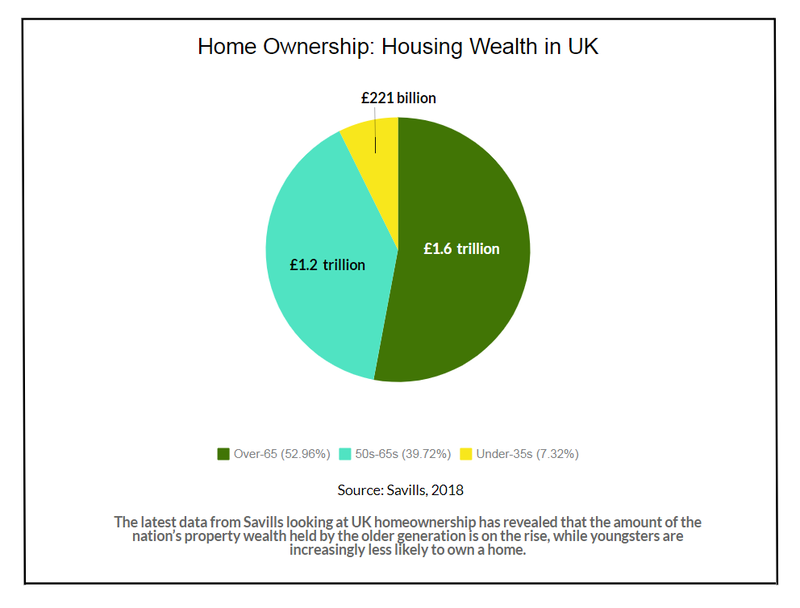 The latest data from Savills looking at UK homeownership has revealed that the amount of the nation’s property wealth held by the older generation is on the rise, while youngsters are increasingly less likely to own a home. It looks like the odds are stacked against UK’s younger population. Many are leaning towards alternative ownership schemes, and in most cases, are opting to abandon the idea of owning a house entirely, in favor of renting. The latest data from Savills on UK homeownership revealed that the wealth generated from the nation’s property market and held by the older generation, is on the rise. Meanwhile, what seems to be increasing for the UK’s younger generation is how unlikely they are to own property. Recent statistics from the Institute for Fiscal Studies show that the 25 – 34-year-old age group are around half as likely to own a property now than they were 20 years ago. 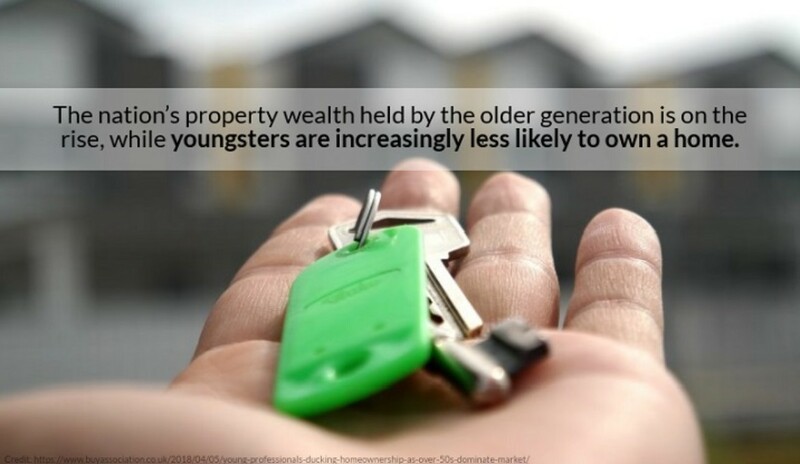 A whopping 75% of housing wealth in Britain is held by the over-50s, with a meagre 6% belonging to the under-35s. Zooming in on more specific age groups, the over-65s currently dominate the housing market, holding 43% of the country’s real estate wealth. This illustrates the thinning group of homeowners in Britain’s younger generation. A deeper analysis reveals that homeowners have piled up equity by living longer, paying off their mortgages and watching as prices grew steadily in the final decades of the last century. While the latter has proven to greatly benefit the older generation, it has become quite the game changer for young, first-time home buyers. First-time home buyers are finding that complete homeownership is moving further out of reach as average annual income currently struggles to keep up with skyrocketing house prices. House prices are now 5.2 times higher than the average income, while in London, it’s a staggering 14 times higher! In most regions, it takes the average first-time buyer about eight years to save for the deposit needed to buy a home. This rises to nine years in the southeast and 11 years in London. The typical deposit required to purchase a one-bedroom or studio apartment in London is £77,407, and £112,555 for a three-bedroom home. Meanwhile, the median income of a first-time buyer in London averages at £66,111. The stark reality is, many are unable to save such a sum and over a third reported that a proportion of their savings came from a gift or loan from family or friends. UK’s younger population is currently looking towards alternative ownership schemes, and in most cases, opting to abandon the idea of owning a house entirely, in favor of renting. The alternative scheme referred to is shared ownership, whereby buyers have the opportunity to purchase a percentage share of a property between 25% and 75% of the home’s full market value, paying a subsidised rent on the remaining share. Buyers can then choose to purchase additional shares as and when they can afford to, known as staircasing, allowing them to ultimately own their home outright. Renting, on the other hand, has been gaining momentum, with a considerable number of people turning towards it by choice. A research conducted by AXA revealed that less than 50% of its research participants are renting because they cannot afford to buy their own homes. The research also revealed that many enjoy the freedom of not being tied down by a hefty mortgage! While UK’s older generation is predicted to continue benefiting from house price growth, the future is also welcoming a new wave of young renters. More people are choosing renting as a lifestyle option, particularly young professionals who enjoy the flexibility of renting, whilst being mortgage-free. Jamie, a Business Manager for a Health GP Company in Northumberland, has a positive viewpoint of the evolving property market in the UK: “I have no issues with (renting). There is, to a degree, temporised value; you can often live in a nicer area, nicer street etc. for a cheaper monthly payment than a mortgage payment. Some see renting as ‘throwing money down the drain’, but I see it differently. Renting allows you to become, in some odd regard, a more static member of the travelling community,” he says. Britain seems to be transforming into a nation of renters, which only adds to the appeal of property investment. For more information on this, click the following link: https://csiprop.com/britain-a-nation-of-renters/. If you are interested in investing in UK property, do contact us!